The law discriminates among a corporation’s secrets. In the eyes of the law, commercial secrets of corporations are legitimate secrets that deserve legal protection and nondisclosure, but personal secrets of executives are not as deserving of legal protection and nondisclosure. This divergent treatment of secrets has resulted in a legal landscape of perplexing, paradoxical paths for corporations and executives concerning executive disclosures — a precarious landscape that has left corporations and investors dangerously susceptible to revelations of private facts that shock market valuation and institutional stability. This Article explores this divergent treatment of secrets in the context of public corporations and the private individuals who manage them, and offers a new way of thinking about corporate and personal secrets. 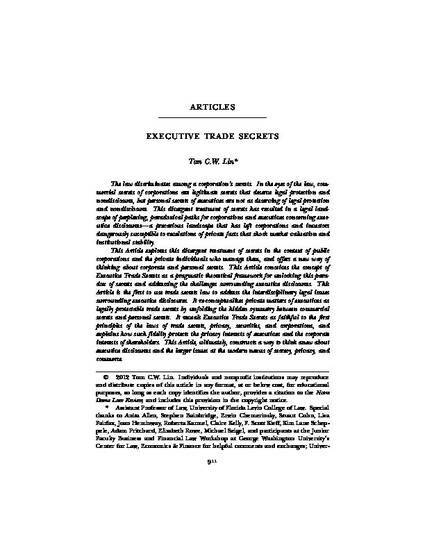 This Article conceives the concept of Executive Trade Secrets as a pragmatic theoretical framework for unlocking this paradox of secrets and addressing the challenges surrounding executive disclosures. This Article is the first to use trade secrets law to address the interdisciplinary legal issues surrounding executive disclosures. It re-conceptualizes private matters of executives as legally protectable trade secrets by unfolding the hidden symmetry between commercial secrets and personal secrets. It reveals Executive Trade Secrets as faithful to the first principles of the laws of trade secrets, privacy, securities, and corporations, and explains how such fidelity protects the privacy interests of executives and the corporate interests of shareholders. This Article, ultimately, constructs a way to think anew about executive disclosures and the larger issues at the modern nexus of secrecy, privacy, and commerce.